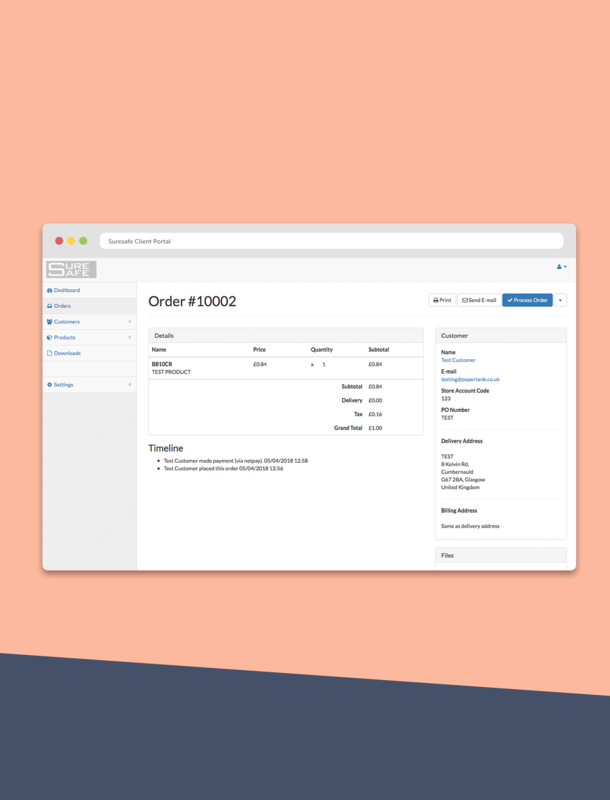 A custom built e-commerce platform allowing Suresafe to automatically process complex orders from their business to business clients. Suresafe is an experienced speciality retailer of tools and safety wear, and competition is both local stores and large online business. Suresafe continues to thrive because they have ambitions to grow and adapt to their customer’s requirements. Papertank are delighted to have worked with them for 10 years. A large part of Suresafe’s business is built upon excellent customer service, their ability to cater to custom orders and a quick turn around for their clients. Papertank worked closely with Suresafe to develop a private e-commerce website for their business to business clients. The system displays client specific ‘mini-stores’ with all of the customers branded items ready for quick ordering. Developing with open source or commercial systems such as Magento and Shopify can seem like the easier option when scoping a new ecommerce project. However, when it comes to deep customisation of the order process, navigation, shipping options and customer accounts, a bespoke solution offers more flexibility and integration options. This is what lead us to building SureSafe’s new platform using the latest web technologies and our bespoke “Blanket” e-commerce framework. This would give us the flexibility to not only cater to what was asked of us right now, but help build upon what would be required in the future. With a system designed by our own team, we know exactly how it might scale, integrate and evolve to speak with other management systems if the need arises. Michelle Todd, Marketing, IT and Customer Relations – Suresafe Protection Ltd.